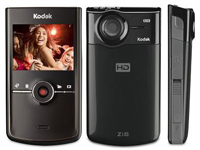 Kodak Zi8 Pocket HD Video Camera Firmware and Software for Operating Systems. This firmware version provides WINDOWS 7 compatibility and improves the following features: Audio recording and playback; Digital Zoom; User Interface; Video quality in low-light conditions. , and filed under Digital Camera and tagged Kodak Zi8 camera firmware, kodak zi8 firmware, kodak zi8 software, kodak zi8 software for mac, kodak zi8 video camera, pocket, zi8.